HTC seems to be having a hard time keeping its 2014 flagships tucked behind the curtain: first the Butterfly 2, and now this. If the leakster from Baidu Tieba forum is to be believed, we're apparently looking at a blue chassis of the HTC "M8" which, according to @evleaks, will be the first device to feature HTC's upcoming Sense 6.0 interface. Combining this and the fact that the HTC One is codenamed M7, chances are the similar-looking M8 will replace said flagship device next year. While the spy shots are of low resolution, you can still spot a couple of physical changes on the M8. Most notably, there's a mysterious hole above the camera, and the leakster -- who denies being an insider -- suggests it could be for a second camera. Our money's on a fingerprint reader à la One Max, except for the adjusted position to accommodate our index finger while holding the smaller phone. The chassis' metal also extends to around the edges, thus eliminating the need of "zero gap injection" that increased production difficulty for the current HTC One. Besides, it looks rather nice in the photos. 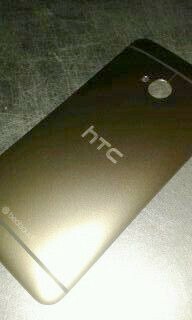 Lastly, the same person also shared a photo (posted after the break) of a gold-colored HTC One chassis, which supports an earlier leak from September. Seems like HTC's keeping this one for the holidays, but of course, the real gold version is already available if you have extra cash to burn.